My time off, so far, isn’t spawning any brilliance or creativity. In fact, I am further behind now than I was while I was regularly blogging! If that isn’t bad enough, we lost an hour yesterday with Daylight Savings. There is no way I’m catching up with anything. How is everyone doing? Is anyone having a leisurely time of it? Or are we all as hectic as each other in our respective routines? I have been working on some projects however, and once they get going I will tell you all about them. One productive thing I have done the last few weeks, is finally getting some business cards printed! It only took 3 years but here they are; what do you think? I had my own photographs printed with all my essential information on the back. I love them so much that I don’t want to give any away! In between my hectic weekdays, we do get a calm weekend and if it’s the weekend my husband is off, it’s incredibly relaxing! We just seem to lounge the day away. On one of these relaxing weekends when I wasn’t running around with my head chopped off, and had a bit of time, I made these Moroccan spiced and Harissa laced Sweet Potato and Ground Beef Phyllo Cigars for a lunch time snack. I had cooked and mashed the potatoes a day before and also had leftover spiced ground beef from dinner, so these were put together quite quickly. Of course, if you’re not adept at tackling phyllo dough, it may take you longer. I find phyllo dough totally frustrating and so, usually buy the #10 thicker sheets. This time however, I had the #4 thinner sheets and yes, they drove me crazy. When you’re finally biting into the crunchy, flaky pastry you forget the torment it caused you and relish the tasty morsels; enticingly exotic from the ras el hanout and deliciously spicy from the Harissa. I alway think that something creamy inside the crispy pastry is a great combination. The sweet potatoes add the perfect creaminess with the ground beef and the flaky pastry. I haven’t included the rolling tutorial but if you need help, please check out my earlier posts on phyllo pastry: Kale, Feta and Potato Phyllo Rolls or Kunafah Rolls. Crisp phyllo pastry rolls filled with creamy sweet potatoes and spicy ground beef. Mash the sweet potatoes until no big lumps exist. You want the mash to be fairly lump free and smooth. Add the Harissa paste, cumin, coriander and salt. Check the seasonings and adjust as desired. Add more Harissa if you'd like it more spicy. In a large fry pan, heat the oil on medium and add the chopped onions. Cook until lightly browned and add the garlic and ras el hanout. Cook until the ground meat is no longer pink and fairly dry. Add the mint and cilantro. Add the milk to the melted butter and keep aside. Unpack the phyllo sheets from the box and plastic wrap and lay on a tray and cover with a damp towel. Take a sheet of phyllo dough and lay on the counter or chopping board and carefully cut in half if not done already. Make sure the rest of the phyllo sheets are covered back up with the wet towel. Brush liberally with the melted butter and milk mixture. Lay a couple of teaspoons or so of mashed sweet potato and a teaspoon of ground meat in a log shape at one end of the phyllo sheet. Now, gently roll up the edges into an egg roll shape. Brushing with more butter and milk if needed to keep the roll moist and able to stick. Place on a baking sheet until you finish rolling the rest. Bake 12 rolls on a tray and space them apart. If you want to bake them immediately, preheat the oven to 375℉. Bake the rolls for 20-30 minutes until golden brown and crisp. I chose to do North African spices, but these can be any spice you want. Try an Indian version or Middle Eastern. I hope there are signs of spring like weather where you are and it’s bringing you great inspiration and promise of sunnier days (though I like the not so sunny days) We’ve had some great days lately and this weekend was wonderful, albeit a little windy. Trace and I drove with a couple of the kids up by Longs Peak and Estes Park with hopes of maybe getting in a hike. It was so windy we couldn’t stand up straight! The weather was beautiful though with just the right amount of sun to make Lake Estes glimmer beautifully. The wind however, was having a blast blowing snow off the mountain tops. Thank you, Kiran! I am well thank you! I love these phyllo morsels though I feel your pain as far as the time & work involved. I once made samosas and trying to make a lighter version, I used phyllo instead of puff pastry like my friend did. It was a lot of work trying to shape those triangles and just working with the thin phyllo. Worth the effort…once in a while. I really like the sound of sweet potatoes & beef. And those recipe cards are really lovely. Thank you, Monica! Phyllo is tricky but if you can find the slightly thicker sheets, they are much easier to handle. Good luck! These sound lovely. I often make little chicken puff pastries with sweet potato but I think the filo and beef combo sounds delcious. Added to my recipe list to try! Thanks Krissie! I do like chicken puffs, yummy! i guess i’m gonna enjoying your party if you serving this as appetizer…. Lovin your ethnic fine plate too, all looks stunning!!! Thanks Dedy! You’re welcome anytime!! Merci beaucoup, Josephine et merci pour votre commentaire! I didn’t even know there were different thicknesses of filo pastry?! Perhaps they just don’t sell different types here. I don’t find it too bad to use… you just have to be careful. Once everything is safely encased and you can concentrate on rolling then it comes together well. Charles recently posted..Beetroot Muffins, a.k.a how to trick kids into eating vegetables! Try the ME stores, Charles. At regular supermarkets they only send one kind and usually its the annoying thin sheets. I have a great market here that sells ME and Eastern European stuff so I can find the different sizes. I really like your business cards Nazneen. Great idea. I need to get new cards also, with my new logo. And these cigars? They look incredible and hard to make (for me). Love that photo of Long’s Peak with the snow blowing like crazy. I am terribly behind things too, drowning between assignments and book editing, plus the weather outside is so lovely, hard to concentrate. I like your business cards, I’ve did mine the same way, have you used moo to print them? Thanks Gintare! Yes, I did use Moo. I’ve been looking at their site for months but never got around to doing my cards. They had the best deal and they can do so much with your photographs. Thanks for your comment! I love anything with ras el hanout and I love these cigars. Perfect finger party food and perfect for a fun dinner! And I didn’t know phyllo came in different thicknesses! As soon as I am back we will plan a date! Still nursing my mom in Phoenix and hope to be back early next week! What beautiful business cards you made! Did you do them yourself or did you have someone make them for you? If you made them yourself you should do a DIY post. Sweet potato mash with beef is a nice combination and I like that they are baked, not frozen. Thank you Mireya! No, I had this company called Moo do them. They’re excellent and I recommend them! Sooooo… I’m waiting for my invitation to dinner daaahling. I promise to behave myself and only eat one phyllo cigar at a time… maybe. These look so delicious! I love sweet potato in anything it is my comfort food and wrapped in Filo with African spices… YUMMY! I love ground beef in some sort of pastry. These little “cigars” look so delicious – I want to eat them all! Hi GG! Thank you. No, I am using the same lens but lately I haven’t been putting it on a tripod. Hand holding it allows me to get closer but man, do my hand shake! It’s so hard to maintain this sucker sometimes, I don’t think people realise before they start one! Nazneen, This is my first time to your beautiful blog! Your photos are gorgeous! This recipe intrigues me, I am of Lebanese descent and these actually look like something my grandmother would have made! They look wonderfully delicious! Your business cards are so beautiful, Nazneen! 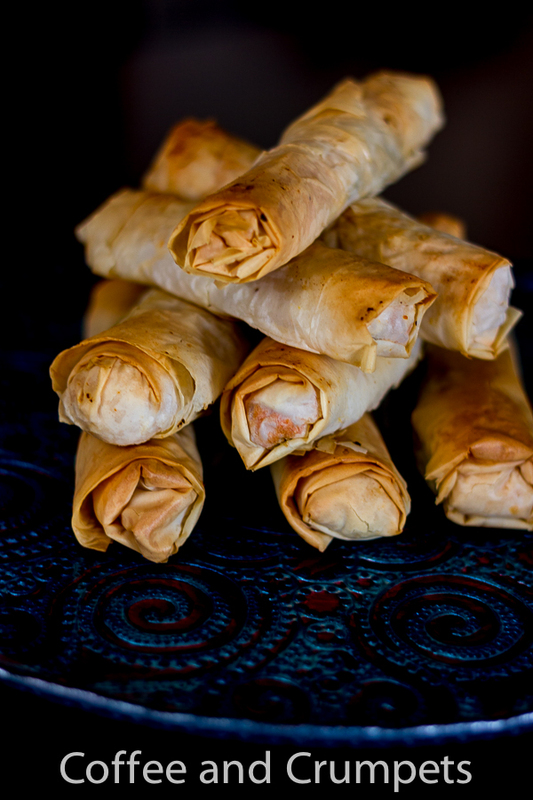 The Phyllo cigars look and sound delicious, love the combination of spices for the filling. Looking forward to hear more about your projects. Thanks Daniela! I will keep you notified! Love the recipe and the business card idea with your recipe photos! Can I borrow this idea? I love your beautiful photos of Colorado, your recipe and your business cards. Life may by hectic but you sure did a wonderful post, Nazneen. BTW, is the phyllo that you buy at a regular store the thick or tiny version? Btw the business cards look fantastic! Great looking business cards! And wonderful looking dish. I use phyllo dough occasionally, but it usually gives me a bit of trouble. Largely because I use it so seldom I’ve really never developed proficiency in handling it. Maybe I should make these lovely “cigars” every week until I master it? 😉 Really nice — thanks. The business card is beautiful indeed. And also, the first click of this post is beautiful. The phyllo cigars sound packed with so much flavors. Love, love, love your new business cards what a great idea. I didn’t realise you could get different thicknesses of filo pastry though that’s a new one for me. These cigars are the sort of thing I’d order off a menu and hubbie would wish I made at home! Thank you, Nancy! I keep hearing that from many other bloggers about the different thicknesses. I think if you go to a run of the mill grocery store, you will find only one. Go to a ME store, or an Eastern European place, you will find a fridge full of phyllo pastry boxes, in different shapes and sizes. Thanks Bobbi!, I think I’m done with my break 🙂 It’s hectic either way so I will just continue! I may scale back to one post a week though. Oh, Nazneen! I can so sympathize with your plight. I took the month of January off and have yet to catch up. Sometimes I think I should have just kept blogging. Hang in there. You’ll work out a schedule that will better suit you. Thanks John! Yep, I know, I remember we discussed this in a FB conversation! I think there is no catching up, you just get on with it. Eventually, you get a break somewhere down the road :)Stick with it John. I for one love your visits and your recipes. Thanks Charlie! It’s one of those things that you mean to do but it never seems important until you’re telling someone about the blog and they ask you. Then you wish that you had just ordered them!! This time, I did it 🙂 I’m also picking up some catering jobs so I kinda needed them. I like anything phyllo … sweet, sour, salty, tangy almost anything stuffed in this heavenly dough I can chomp on it all day long 🙂 yours look so nice. Your photos are really so nice. JAK, Amira! Yes, I love phyllo too, just hate working with it. Even having used it for years, it still annoys me endlessly! Your business cards are great- they remind me of polaroids! I know how tricky phyllo can be, but your cigars turned out wonderfully! Mary Frances recently posted..In Southern Cali!! Beautiful Nazneen, I love ground meat with phyllo dough and I’ve just started to use sweet potatoes… so your recipe could perfect for the next appetizer! Margherita@lapetitecasserole recently posted..Turkey and Feta meatloaf with soy mayonnaise. Thanks Margherita! I hope you like them. You are getting to be an expert with phyllo dough so you’d have no problem rolling these up! No one needs to smoke any other kind of cigar, this looks absolutely incredible 😀 That filling looks very flavourful! Do you have ANY idea of how I am salivating right now? And I don’t even eat beef. These are gorgeous, and while your photography tips the other day were worth a million bucks, I still have miles to travel before I reach anywhere close to these gorgeous clicks you have achieved. Ahhhhsome!! Replace the beef with chicken or mutton. The sweet potato is the major component. Thanks for the kind words :). Your photos on your last post were beautiful. Nazneen: These are the only cigars that I would happily try in my life… They look beyond delish! I loved your idea to print business card with appetizing pictures in the front and your info in the back…Definitely an intelligent way to spread the word and attract business. Success!!!! Your business cards are so beautiful! I can easily see wanting to hoard them for yourself… And these cigars look like such a perfect treat. I don’t often work with phyllo, either, and until this post I never knew it came in different thicknesses! I think I have to get brave and try these on your recommendation. The use of sweet potatoes is inspired! Thanks for a beautiful post! And, by the way, I love your blue plate with the red swirls in it! Gorgeous. Nazneen – your photos are MARVELOUS! WOW! And these “cigars” sound so good! Not to mention look absolutely delish! These photos totally ROCK. Beautifully done business cards too. I doubt you had trouble with the phylo. The cigars are very well done. Thanks Ansh! No, I managed the phyllo just fine but it’s so frustrating regardless! Thank you so much Shelley! I have no problem working with phyllo, I know the trick now but still, it can be so frustrating! I remember driving through Ohio one winter, I’ll never forget my temp gauge on the car it read -6. By the time it was 9am, we had gone up all the way to -2 :), and at that time we lived in Texas so it was a shack to our system. My sister lives in Columbus and we had the chance to visit her a couple years ago. I like Ohio, its like Texas but colder and hillier. I love Colorado and purely for the landscape, the Rockies are amazing. Try not to get down too hard on yourself. I can understand feeling like you haven’t gotten anything done and that you’re so behind (hellloooo motherhood LOL!). Honestly, it’s been a productive day if you can even can 1 thing checked off of your to-do list. These sigaras look amazing! Have you tried using Yufka pastry? It’s much easier to handle than phyllo. Sweet potato and beef are such a gorgeous combination with the addition of warm spices. I’ve been experimenting quite a bit with phyllo but I still prefer puff pastry. Your cigars have held their shape perfectly which is not always the case with me. These would be huge crowd pleasers. Dear Nazneen, I love working with phyllo dough – it took me a while to find really good one that I can work with but now that I have, I like to try out different recipes with it and your potato and ground beef cigars look perfect for our family. We really enjoy sweet potatoes and ground beef is always a winner at our house too. And I love making exactly these kinds of “snack-type foods” – thanks for sharing this recipe and your amazing pictures! Hope you are enjoying your “time off” and taking really good care of yourself – looking at your landscape pictures I should tell you that we had a summerlike week, 20 degress Celsius warm and people are sitting outside sipping their coffees – way too warm for this time of year but enjoyable nonetheless. All the best – by the way, your busines cards are very pretty! I would like one, please!